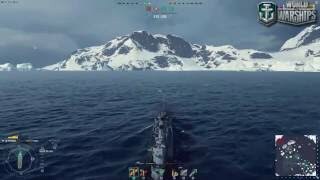 Team fights at sea, the historical confrontation of courts, lots of cards with beautiful scenery - all this is waiting for wanting to play World of Warships. For those who are familiar with the predecessors of the game World of Warships - tanks and planes - the gameplay is not present is nothing new. In a sense, it is good that everything is comfortable and familiar. The whole game determines the choice of the ship: cruiser, destroyer, battleship or aircraft carrier. Later, we will see in them. In the meantime, start with the first step and be sure - you create your account. It is very simple: click on the button Igrat in World of Warships at the bottom of this review, and get to the game site. Then - you just need a quick and simple registration: For this type in these fields as well) address (a must!) Of the current mailbox; b) come up with your login in the game; c) the password to log in to a game account. After that - a confirmation e- mail by clicking on the link in the email, and can participate in the most beautiful sea battles. 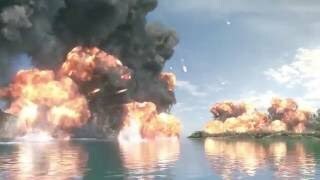 We remind you that the registration World of Warships - free of charge, as the game itself. Play World of Warships without registration is also possible. To do this, you will need to log in through one of the most popular social networks - Vkontakte, Facebook or Google+. But coming up with a login and password for the game World of Warships is necessary even in this case. Keep in mind that not all browsers properly pass data from the social networks, so we recommend that you use for the game of World of Warships without registration Google Chrome. Destroyers - tiny, with a minimum of armor, and seemingly vulnerable ships that can destroy several large-caliber projectiles. However, they are maneuverable and have the firepower, enough to cope with the biggest ship World of Warships - battleship (of course if they can get close to it). People like ships: there are small, medium and large. So cruisers - just the most middling: they have enough armor and maneuverability with speed. They can make a serious competition as the destroyer and battleship - then the whole thing depends on the configuration. If you see in front of him slowly and impressively floating giant, you know - it linkor . It is the most armored, bears a large-caliber gun, shooting at a distance of 10 kilometers. Lack of battleships - their slowness and sluggishness in motion on the water surface, and in the management of the guns. At a meeting on open spaces of the"little"game World of Warships from the"big"- nimble destroyer to bomb a huge battleship, to the point long made ​​targeting the huge and powerful guns of the latter. I completing a variety of techniques with which it is necessary to get acquainted wishing to play World of Warships online - it avianostsy . They - a completely separate class, and completely separate the specifics of the game, a little like an MMO. The player's task in this mode - handing out orders, and watch the flying bombers on the map, fighters and torpedo these orders will perform. It's all. Carriers - most frail ships in World of Warships. addition to the above, the ships in the game World of Warships are the division of the countries: the United States and Japan. At the moment, there are few elite Soviet, British and German ships, we hope to increase their range in the future. marine vessels also are divided by levels - from the first to the ninth. As usual, you start playing with a ship of the first level, and gradually pumped it. The most optimal considered 6-7 level vessel in the parameters for which there are even some rank fights. The World of Warships to play online for free - fun things. The game is smooth and beautiful, with a lot of cards from the northern icebergs to tropical equatorial waters. And start playing World of Warships is very simple: go to the port, choose what you of the ships, and go to play in a real sea battle. Bitvy sea occur between the two teams: a 8 by 8, if you play with the computer, or 12 to 12 - for real gamers. Creators of the game did not delay the battle, bang-bang, and you're done. Exception is perhaps a little strange that a collision between the two battleships. The more benefits you will bring team, which will play World of Warships online - the more will get bonuses for leveling his ship. We wish you a successful sea hunting! Start playing World of Warships now. Link to register - under review. Chtob in World of Warships to play for free, you will need a PC or laptop connected to the Internet, with at least the following parameters, and a comfortable mouse. speed internet connection of 1024 kbit / s (for the operation of voice chat).